Reportedly, recommendations have been made to PM to increase gas prices by 34 percent from January 2012, impose levy for next 15-20 years to build Rs100bn gas pipeline, keep existing fuel surcharges, transfer increase of gas prices on commercial sector to consumers, and use tax money to pay for subsidy to make imported gas affordable (Increase in gas tariff for all sectors proposed, local news, Dec. 29, 2011). The increase in gas prices and giving subsidy to energy mafia shows that PPP government has failed to devise a comprehensive energy policy. Due to government’s pro-energy mafia policies, the sector is profiteering at the cost of public and national interests. Pakistan therefore needs to adopt alternate energy to provide relief to public, sustain economy, generate jobs, reduce energy prices, end fuel subsidies, cut dependence on energy imports, decrease inflation, and control trade imbalances. 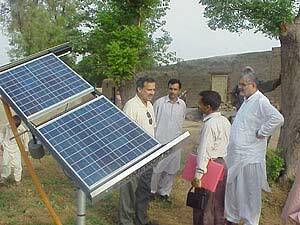 Islamabad needs to adopt renewable energy to provide immediate relief to domestic sector, cut energy spending and overcome energy deficiency on war footings. Reportedly, China has said that the cost of electricity generated from wind, solar and coal will be the same from June 2012. According to US experts, the use of Chinese solar panels and wind turbines has brought down prices of energy in America and it has benefited US consumers(Chinese solar benefit US consumers too, Dec 11, China Daily). In UK, the cost of solar panels has come down by 30% since April 2010. Today, Britain’s installed capacity is nearly three times greater than the projections of the government when it launched the solar energy scheme for domestic users 18 months ago (Britain’s solar energy boom …Oct. 31, The Guardian). Islamabad and Beijing can enter an energy alliance. Reportedly, China’s renewable energy sector is facing stiff resistance from protectionist policies of West. It has forced 42 percent of China’s renewable energy industry to find new markets. Islamabad can use their expertise to overcome energy shortage in the country within six month with help of plug and play renewable technology. Beijing can also help Islamabad develop renewable energy products, grid ready wind turbines and solar farms, smart grid technology, and two-way electricity meters, which are used to record electricity sent to local grid by the individual house and its consumption. China is generating fifty thousand megawatts. Countries like Germany, USA, and UK are successfully using these technologies to reduce electricity cost. Islamabad needs to end use of gas by the industrial and private owned public transport sectors. Reportedly, both sectors were allowed gas use to give relief to the public through low prices, but they pocketed profits and subsidies incurred loss to national exchequer. Similarly, successive governments have been deceiving the public by giving gas subsidy to the fertilizer sector to benefit selected few, including those who benefited from its privatization in the first place. Islamabad needs to make laws in line with India mandating major industries including textile to adopt renewable energy. Reportedly, 80 percent of India’s textile industry is using solar energy. Natural resources cannot be used to support private industry in Pakistan that too at the cost of domestic consumers and profiteering. Thus, laws need to change to give domestic gas users priority and incentives to industrial sector to adopt renewable energy. The proposed prices of gas in the news report are inflated. As per the figures, Rs. 482 gas will have Rs. 730 local tax (151 percent of actual price). The proposed cost of US sponsored Turkmenistan (TAPI) gas is 12 to 13 dollars per unit, which is almost double the price of Russia and Ukraine gas agreement of $200 per 1000 cubic meters (Ukraine Russia reach deal on gas price, Nov. 16, 2011, China Daily). Pakistanis should not be forced to protect American energy interests in the region. Similarly, it is illogical to pay $ 16 to 18 for LNG, which is locally available for one dollar. Instead of giving subsidy to the energy mafia, renewable energy should be used to meet energy shortfall on lines of China. Beijing has established more than 480 electric charging stations to help one million electric cars users. It will help state earn revenue, keep the cities clean and meet UN anti-pollution standards. In addition, metro rail systems and renewable energy be used to cut travelling and transportation costs. Furthermore, renewable energy can be effective in providing electricity to urban centers and rural communities to improve living standards, increase employment through cottage industry and reduce poverty at grassroots. There is a need to adopt energy saving strategies. China has given incentives to promote use of energy saving lights instead of traditional light bulbs. Beijing with cooperation of industrial sector, reduced prices of energy efficient home appliances to promote energy efficient products including washing machines, TV, increase sales, reduce fuel imports, promote use of solar heaters, photovoltaic cells, electric cars, and cut CO2 emissions. UK is giving “green deal” loans schemes to make homes more energy efficient and adopt renewable energy to cut energy bills ( Nov.2, 2011, the Guardian). In addition to promoting use of renewable energy, government should also encourage use of UN based Kyoto energy products in rural areas (http://kyoto-energy.com/products.html). Government can cut energy consumption and corruption by adopting renewable energy in its buildings, community centers and public places including streetlights. These policies can help Islamabad promote businesses, generate millions of jobs and reduce fuel imports. Nationalization of energy sector can play an important role in reducing the prices of electricity and gas. The news report shows that public is going to pay Rs. 38 bn for gas imports and construction of Rs.100 bn Pak-Iran gas pipeline. The report also shows that Petroleum Levy Amendment Bill 2011 and Gas Infrastructure Development Cess (GIDC) Bill would remain applicable for next 15 to 20 years to pay the required funds. The oil producing countries are also proposing an increase in oil prices. Since energy prices are going to increase and public is going to pay for the energy sector development therefore Pakistan’s energy sector should be under public control with government pay structure to reduce expenditures by 40 percent and improve services. The state controlled energy sectors of Russia, China and Gulf states are producing cheaper electricity, adopting renewable energy and linking the countries to the global energy networks. Jordan is reviewing controversial privatization deals in national interest. It is about time Islamabad nationalized energy sector and scrapped all shady privatizations. Finally, renewable energy can help protect national interests. Russia and Germany has launched Nord Stream pipeline to deliver gas directly (bypassing traditional transit countries Ukraine, Poland and Belarus), and linking other western European countries(Nov. 26, wsws). It creates an alternate to US dominated security alliance in Europe, ME and Persian Gulf. The US led NATO Alliance in UN on Libya was successfully challenged by Berlin, Peking and Moscow alliance to counter US strategy in North Africa. Russia’s South Stream project aims to link Asia and Europe to counter failed US Nabucco project directed to deliver gas to Asia via Turkey. Pakistan should therefore review $7.8bn TAPI gas pipeline and instead link ME with Europe-Russia-China energy market through Gwadar to create $700 bn energy and trade corridor for strong economy and independent foreign policy in line with Morocco-EU € 400bn MENA renewable energy network alliance as part of ‘Liberalization of Energy Markets’ (Nov.2, the Guardian). Islamabad should invest TAPI funds on renewable energy and dams to generate electricity, and improve water storage for agriculture.